Its opening act involved the occupation of the defenceless city of Jerusalem by the forces of the Ayyubid emir of Kerak in 1239. Against the backdrop of internecine conflict in the Muslim world, over the next two years minor crusader armies were able to play Muslim factions of against each other, thereby securing the return of the city of Jerusalem and greatly extending the frontiers of the Kingdom of Jerusalem. But the regional balance of forces soon shifted again and the Muslims retook the defenceless city in 1244, subsequently massacring its Christian inhabitants and torching the Church of the Holy Sepulchre. This set the stage for the final three acts of this phase of the crusades to the East. The Seventh Crusade (1248-54), led by King Louis IX of France, was a direct response to the loss of the Holy City. Louis led a massive army to Egypt, occupying Damietta almost without resistance and then advancing on Cairo. Stiffening Muslim resistance and an outbreak of dysentery within the crusader army, however, turned the tide and Louis was forced to withdraw toward his operational base at Damietta. Additional Muslim successes soon rendered the crusader army’s position untenable and Louis’ first bid to liberate Jerusalem ended with him surrendering to the sultan of Egypt on April 6, 1250. The Eighth Crusade (1270) was King Louis’ second attempt to liberate the holy sites. This time he adopted a three-step strategy: first, attack Tunis; second, advance along the north African coast and take Egypt; and, third, liberate Jerusalem. At first, the expedition went well: Carthage fell to Louis in July 1270 and a Sicilian fleet led by Charles of Anjou was nearing the port with reinforcements that would allow the king to exploit this initial victory. On August 25, however, Louis died of dysentery; the crusade was abandoned shortly thereafter. Finally, in the immediate aftermath of the failed Eighth Crusade, Prince Edward of England led an expedition to the Holy Land to help defend Tripoli and the rump Kingdom of Jerusalem. This was the Ninth Crusade (1271-2), conventionally considered to be the last major crusade to the Holy Land. It ended when a treaty was signed between Egypt and the Kingdom of Jerusalem. Upon the death of his father, King Henry III, Edward returned home to assume the English throne as Edward I. As this necessarily schematic sketch clearly indicates, the crusades to the Holy Land were a product of the interaction of several factors: they reflected the distinctive war-making capacity of the Church (the crusader army and the military religious orders); they expressed the interests of the papacy (the liberation and defence of Jerusalem); and they were made possible by the institution of the crusade (constituting the Church as a legitimate war-making unit and the “crusader” as a recognizable form of actor with a defined portfolio of religious interests). Of course, crusading was not the only form of war conducted by Christian powers in the Holy Land. The dynamics of public or political war were clearly at work throughout the two-centuries long Latin political presence in Syria and Palestine. Nevertheless, any serious account of medieval geopolitics must recognize and take into account the distinctiveness of these ecclesiastical wars. While often intertwined with other forms of violent conflict, the crusades were not reducible to them; nor were they motivated by the same underlying constellation of war-making units, structural antagonisms and institutions that gave rise to these other forms of war. Rather, they were a distinctive form of organized violence – one that, as we shall see, also found expression in other parts of Latin Christendom. 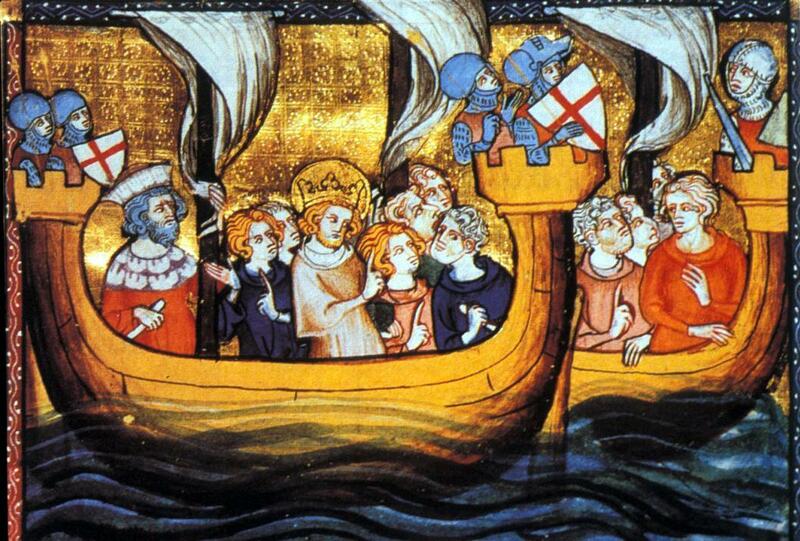 Top Image: Louis IX on a ship departing for the Seventh Crusade, as shown in a 14th century manuscript.